Oakland’s 40th Street is looking decidedly more colorful these days. If you’ve been wondering what the bright-green five-foot-wide band painted on the road is, the answer is: a sharrow. It’s part of an experimental pilot program that aims to improve bicycle access on 40th Street, which connects Emeryville to Oakland’s Piedmont Avenue and runs past MacArthur BART, one of the most heavily used BART stations by bicyclists. The term “sharrow” directly reflects its intent: to draw attention to the shared use of the street by bicyclists and vehicles. It took the City of Oakland and key stakeholders approximately seven years to compromise on and implement the sharrow. Jason Patton, manager of the City of Oakland’s Bicycle and Pedestrian Program, explained that the only way to create a separate bike lane on 40th Street would have been to remove a lane or part of the median. “We couldn’t get agreement on what would be removed,” he said. The sharrow on 40th Street in Oakland. Cities like Long Beach and Salt Lake City have also begun using sharrows, but the jury’s still out on their effectiveness. Oakland’s Public Works Agency will be gathering data about how the sharrow is used — like whether it encourages more people to commute by bike and if it reduces collisions — in partnership with the Federal Highway Administration and California Traffic Control Devices Committee. The sharrow runs along 40th Street between Adeline Street and Martin Luther King Jr. Way, and then again from Telegraph Avenue to Webster Street. It is being paid for by a grant from the Regional Measure 2 Traffic Relief Plan, which was passed in 2004, raising the bridge toll by a dollar to pay for projects that reduce congestion. Patton said no more sharrows are planned at this time until the analysis on the existing one is completed. 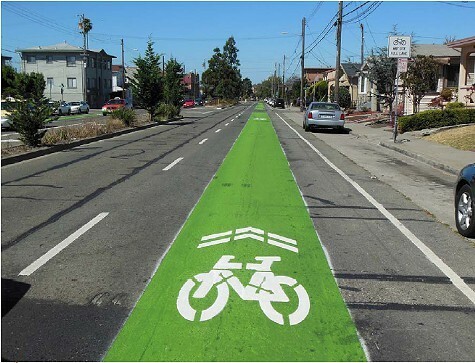 In the meantime, bike lanes are being painted green in other parts of the city. What do you think of the sharrow?